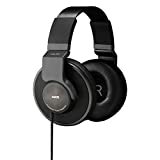 AKG K553 Review (2019) | Best Closed Back Studio Headphones? AKG is an Austrian brand that has made a name for itself via its plenty of professional grade headphones and microphones. The company has been going strong for well over 7 decades and still is regarded one of the best Professional Audio Brand. Hence (for the uninitiated) before we do the AKG K553 review; you now know that AKG is a reputed brand and not some new kid on the block. Launched way back in 2015, the AKG K553 is still a relevant proposition because it gets all the basics right. Hence without wasting much time, let’s get into the official review of the AKG K553. Via product pictures on Amazon or any other ecomm sites, the AKG K553 may not look appealing and would feel very bland and flat in design. However things get really different when you actually hold one in your hand or see it in real life. Due to its overall black look, with shades of grey; scattered around the headphone, and dark maroon metallic plate on the earcups, the design looks timeless and will stay relevant for years to come. The earcups are round and look huge due to inclusion of large 50mm drivers inside them. Proper L and R markings are made inside the earcups to easily distinguish between Left and Right channel. Earcups also swivel around 90 degrees, which makes the headphone to lay flat on the ground. Earpads however are of the leatherette kind found in headphones starting from $50 all the way up to $500. Since the earpads are removable, you can swap them with extra comfortable memory foam or velour earcups. Just like the earcups, the headband too is slightly big and wide compared to other over ear headphones. Aluminum is used for building the frame of headband. However the padding on it leaves a lot to be desired and for a person who has big head like me can feel the aluminum band poking while using it. Another problem that you might face with this headphone is the very long 9 foot cable that can be a mess in itself to manage. Having said that, even due to its sheer length, microphonics is handled carefully because the cable noise doesn’t make its way into the earcups. Since the headphone is meant for studio professionals, most of the times the headphone will either be in your home or studio. Personally I love the 6.3mm connector on the headphone. It’s basically a 6.3mm to 3.5mm adapter, however due to excellent design by engineers at AKG, it looks like a single unit; only to later realize that you can remove the 6.3mm adapter to reveal the 3.5mm jack. As it is with most professional studio headphones, you don’t get much accessories inside the box compared to pile of accessories you get with consumer centric over-ear headphones. Lucky if you can find one additional accessory too. Similar is the case with AKG K553, you get only headphone inside the box along with 3.5mm to 6.3mm adapter and nothing else. Additionally you get product manual and warranty card. ‘Performance’ part of the AKG K553 review is going to be long, hence brace yourself for it. Out of the box, the AKG K553 are a reference grade studio headphones that are positioned to have a flat frequency response for monitoring and mixing audio in a neutral tone. Hence if you need a headphone for similar purpose, the K553 won’t disappoint. Out of the box, you get a great soundstage and stereo separation that one can usually find in headphones ranging around $500, hence for the price the AKG K553 sits at, it’s a complete steal. I’m surprised by the fact that even being a closed back headphone, it tends to have a better sound stage than open back headphones in similar price range. Since the impedance is only clocked at 32 Ohms, you really don’t any external amp to run this headphone, however a DAC is recommended to enjoy this headphone at its full potential. What I personally love is the fact that even at lower volume you can listen to each beat and note clearly without trying to up the volume to get full exposure of the song or audio you are listening. Even while listening to modern music, the headphone sticks true to its neutral sound signature, and the low end frequency doesn’t merges with mid range, while at the same time the trebles don’t distort or feel harsh at all. The people who’ll love the AKG K553 more are the ones who listen to Rock music like me. I felt a joy while listening to various songs right from Bryan Adams to Audioslave to System of a Down. Listening to INXS’ ‘Afterglow’ song is a joy on this headphone and gives goosebumps with the breath taking vocals of JD Fortune and epic balladness feeling. Only people who won't find this headphone interesting are the ones who majorly listen to electronic and trance music. AKG K553 is probably the most under rated headphones in the Professional Studio Headphone segment and you really wouldn’t be disappointed if you get your hands on one. It’s modern yet eclectic design gives it a timeless look that as I said earlier will stay relevant for years to come. Though I would have loved if the padding on the headband would have a little better or a little different design altogether. Still it doesn’t mean it’s an uncomfortable headphone to wear, with regular use you’ll get used to it anyways. However weighing at almost 300 grams, I would recommend taking frequent breaks while using the AKG K553 as it can cause straining on your neck. To summarize, there’s nothing wrong in the sound department of AKG K553. It is as good as any reference studio monitor should be coupled with exceptional design and built quality. Take my words, there are hardly fewer headphones that gets all the department right and AKG has hit the ball out of the ground with the AKG K553. Hope you enjoyed this review and if you did, please don’t forget to share this article on social media sites like Facebook, Twitter, Google Plus and so on.